The best Silverthorne lodging to be found: this townhome is absolutely stunning and even has its own private hot tub. This property is ideal for one or two families: all four of the bedrooms have their own bathroom. Superb family area with an upgraded Full Kitchen stocked with everything needed. Huge HDTV with DVD player, stereo system, Playstation, Wii, & comfy leather sofas adorn the family area. And did I mention the views? Breathtaking! Overlooking a valley with mountains and Lake Dillon are a perfect picturesque scene. Perfect, central location to all major ski resorts! FREE Bus Shuttle right by townhome, less than a block away, to shuttle you to Keystone, Copper, Breckenridge & more! The town home is only a mile from I-70 and downtown Silverthorne. Convenient, indeed! Private, one car garage. One additional spot in the driveway directly in front of garage. A third vehicle can park in the small outdoor lot down the alley. Availability is extremely limited and first-come, first-serve. 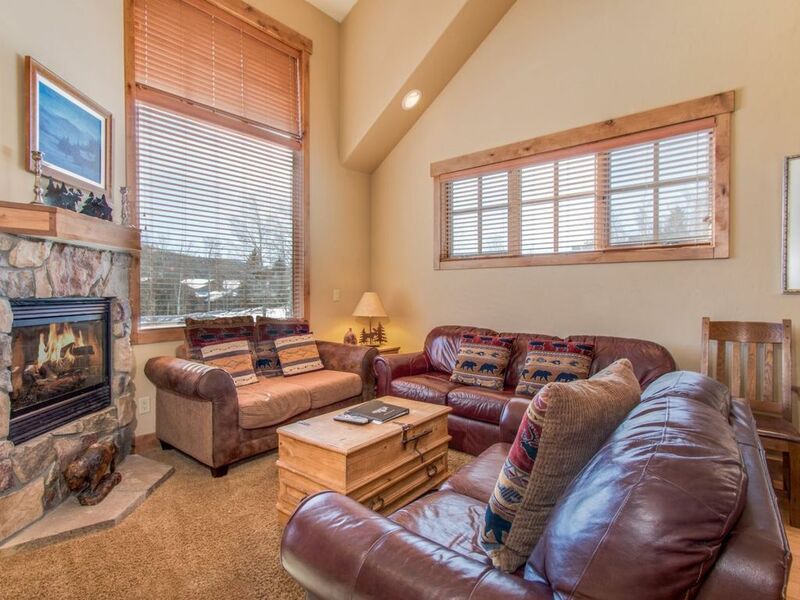 Ski Colorado Vacation Rentals offers the best lodging available in Breckenridge and Summit County, Colorado. Rent your Breckenridge lodging through us. Check for special deals. We provide quality and hassle-free property management for your home or condo. Contact us for a free estimate. Spacious and comfortable in central location. Great place near great skiing! If your party has more than 2 cars parking may be an issue. We really enjoyed that each bedroom had its own bath. Also the dining table was large, seating 10. This could be a terrific place if it were better maintained. Upon arrival there was stuff on the carpet in the main level and lower hall, grit on the kitchen countertops, and a dirty glass in the sink. This may have been left by workmen fixing a leak, but still... We called, and they said someone would be over, but no one showed. I cleaned it up myself. The vacuum cleaner spurted dirt out as you swept. The unit was a little short on supplies. One roll of toilet paper per bathroom was a little inadequate for a week long stay. Toiletries seemed to be just whatever someone else left behind. There were paper towels and tissues. The kitchen faucet had been installed incorrectly so that it worked backwards plus it was stuck on spray, and the mechanism was broken in that position. The dishes weren't very clean, and we soon discovered why. If you use the dishwasher, plan on washing everything before you put them in. It was next to worthless. One of the grandkids dropped something down in the sofa. When we pulled off the cushion--oh my goodness! Just don't look! The home has a nice view, but it isn't very visible from the unit. The windows are all high, and the "deck" is so small that there's barely room for a person to use the grill. Many of the blinds were missing their wand so they were either open or closed. There was a hot tub, but we did not use it as the patio area was filled with snow. The bathrooms were clean. There was a fee if you wanted more towels. We just washed what we needed. It's really time for some new bedding. It was convenient to Keystone and Copper Mountain ski areas. There is a big City Market in Dillon on the other side of I-70. The snowplow did a pretty good job of keeping the street fairly clear. Our group of 7 had plenty of room. There was a TV in the living room and 3 of the 4 bedrooms had a TV, although one was old. There was more than enough storage. Closets were large. All in all we enjoyed our stay, but it could have been spectacular with a little attention to the unit. The views and setting of this place are wonderful. Despite some mechanical issues with the home, the owner worked to resolve them. Its clear this property has been used thoroughly and isn't in the best shape in terms of maintenance and stock (soap, towels, etc), but is still gorgeous. Fair warning if you want to try to sleep more than 10, the pull out beds are not great. I would advise less than 10 stay here. Considering the low price though, it seems like we got a decent value. Great spacious accommodations with plenty of common space and seating for large groups. Overall, this was a very spacious and clean space for our family get together. Often times with these rentals, although there is sleeping space for 8-10, there is never sitting or dining space for 8-10 in the common areas. This is not the case here! Plenty of room all around! My only minor critique would be the differing check-out instructions. The instructions posted on the front door vs in the guest book were different regarding trash collection, heating instructions, etc. I wasn't sure which ones to follow when we were leaving. The kitchen is nearly fully equipped with the most commonly used items for cooking, although we were lacking a glass or metal baking dish for the oven to make a cake.